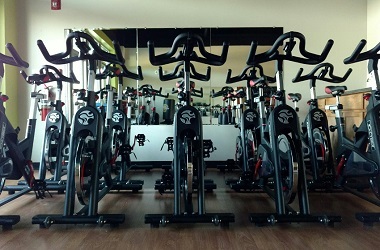 We are pleased to bring Spin to 4ever24fit. Ask a member of our staff for more details. 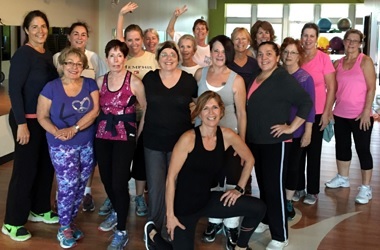 4ever24fit offers a variety of fitness classes at our studio for all fitness levels including Zumba, Bootcamps, Spin, Yoga, Senior Classes, and more! Print this coupon and bring it in for a free day pass! 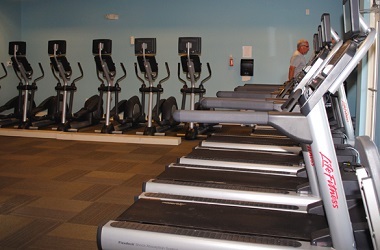 Come check out Leland's only 24-Hour Access fitness facility. 477 Olde Waterford Way Suite 115 in Leland, NC. Call us at (910) 399-4760 or stop by today. Features Life Fitness cardio with attachable TVs, which allows clients the capability of watching what they prefer as time flies by. Cardio exercise is great for weight loss while minimizing the risk of heart attack, high cholesterol, high blood pressure and diabetes. Clients have unlimited access to our facility every day of the year, 24 hours / 7 days a week, guaranteed. 4ever24fit is all about the client's convenience and meeting your needs. Personal training is available. 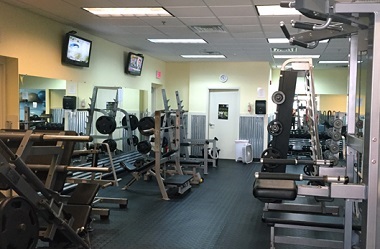 We also provide all new members with a free one-on-one session to acclimate them to our facility. 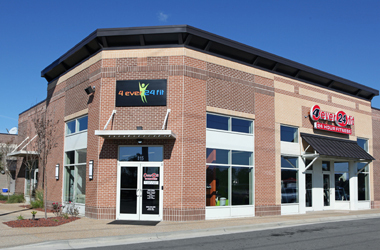 Come join us at 4ever24fit Studio where Group Classes are held! Come on in, we will show you around and figure out the best plan for you. 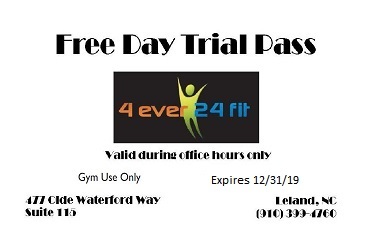 4ever24fit offers single, couple, family, senior and employer discounts. Some restrictions may apply.